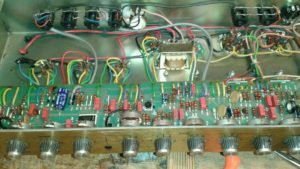 This 1984 Marshall model JCM 800 4212 came in for repair/service. It’s a cool 50W 212 combo with channel switching and Reverb. The amp was working but was noisy and just sounded bad. What it needed was a replacement of all the tubes as those were extremely old and worn. 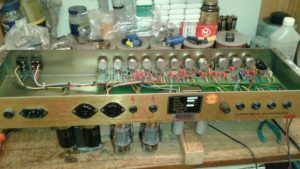 I replaced the preamp tubes with JJ 12AX7s and the power tubes with Tung Sol 6550s and Biased the amp. After the tube replacement things sounded much better but the amp was still a bit noisy and overly bright and piercing sounding. I noticed a mod that was done to the first gain stage to increase distortion and brightness. 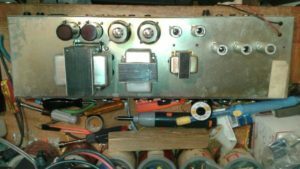 I removed that mod and the tone became sweeter, warmer, cleaner, and the amp made much less noise. I also dressed some wires away from some other noisy wires and got the amp to be even quieter while sounding great. 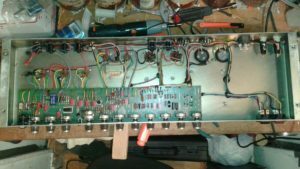 Call me at (917)-757-8855 if you’d like service done on your amp.